: A good working Terrier with ability to go to ground. An excellent companion dog. 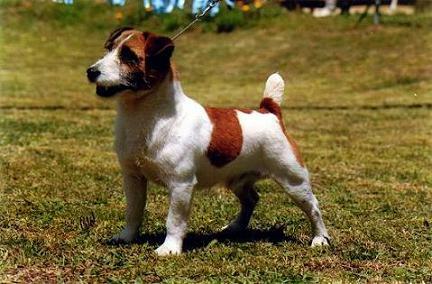 : The Jack Russell Terrier originated in England in the 1800’s due to the efforts of the Reverend John Russell. He developed a strain of Fox Terriers to suit his needs for a dog to run with his foxhounds and go to ground to bolt the fox and other quarry from their dens. Two varieties evolved with basically similar Standards except for differences, mainly in height and proportions. The taller, more squarely built dog is now known as the Parson Russell Terrier and the shorter, slightly longer proportioned do, is known as the Jack Russell Terrier. : A strong, active, lithe working Terrier of great character with flexible body of medium length. His smart movement matches his keen expression. Tail docking is optional and the coat may be smooth, rough or broken. : The overall dog is longer than high, i.e. rectangular. The depth of the body from the withers to the brisket should equal the length of foreleg from elbows to the ground. The girth behind the elbows should be about 40 to 43 cms. : A lively, alert and active Terrier with a keen, intelligent expression. Bold and fearless, friendly but quietly confident. : The skull should be flat and of moderate width gradually decreasing in width to the eyes and tapering to a wide muzzle. : Well defined but not over pronounced. : The length from the stop to the nose should be slightly shorter than from the stop to the occiput. : Tight-fitting and pigmented black. : Very strong, deep, wide and powerful. Strong teeth closing to a scissor bite. : The cheek muscles should be well developed. : Small dark and with keen expression. Must not be prominent and eyelids should fit closely. The eyelid rims should be pigmented black. Almond shaped. : Button or dropped of good texture and great mobility. : Strong and clean allowing head to be carried with poise. : Level. The length from the withers to the root of tail slightly greater than the height from the withers to the ground. : The loins should be short, strong and deeply muscled. : Chest deep rather than wide, with good clearance from the ground, enabling the brisket to be located at the height mid-way between the ground and the withers. Ribs should be well sprung from the spine, flattening on the sides so that the girth behind the elbows can be spanned by two hands - about 40 cm to 43 cm. Point of sternum clearly in front of the point of shoulder. : May droop at rest. When moving should be erect and if docked the tip should be on the same level as ears. : Well sloped back and not heavily loaded with muscle. : Of sufficient length and angulation to ensure elbows are set under the body. : Straight in bone from the elbows to the toes whether viewed from the front or the side. : Round, hard, padded, not large, toes moderately arched, turned neither in nor out. : Strong and muscular, balanced in proportion to the shoulder. : Parallel when viewed from behind while in free standing position. : True, free and springy. : May be smooth, broken or rough. Must be weatherproof. Coats should not be altered (stripped out) to appear smooth or broken. : White must predominate with black and/or tan markings. The tan markings can be from the lightest tan to the richest tan (chestnut). : Ideal Height at the withers 25 cms to 30 cms. : Weight Being the equivalent of 1 kg to each 5 cms in height, i.e. a 25 cms high dog should weigh approximately 5 kgs and a 30 cms high dog should weigh 6 kgs.